I wanted to compare how JiBX stacks against JAXB in terms of performance. From their website, they claim "It also provides very high performance, outperforming all other Java data binding tools across a wide variety of tests.". This sounded great, especially since I've identified that JAXB is a bottleneck. I downloaded JiBX 1.2.6 and proceeded to generate my bindings, only to find that it could not handle my schema. After some research, I found a post that pretty much described the issue that I was seeing. Unfortunately I could not find any ways around this without having to spend a significant effort to modify the schema. Expanding on the post I found, this is what the schema layout looks like (arrows show import or include). I created this image using twopi and dotty tools from Graph Viz. The circular dependencies are quite clear. 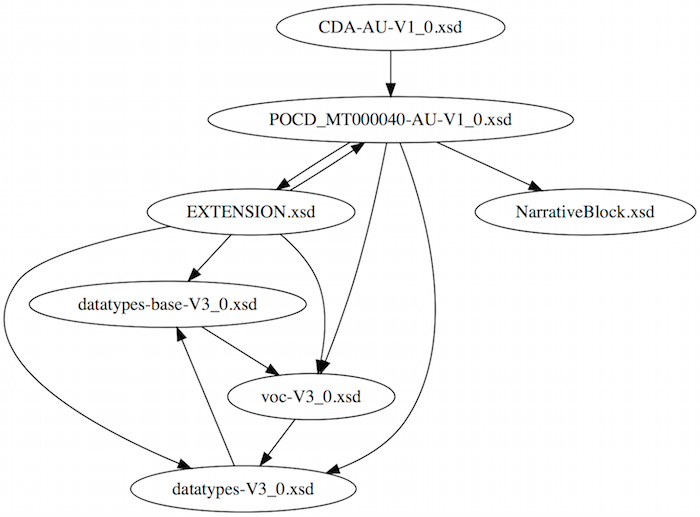 The only schema that I could successfully generate bindings for was NarrativeBlock.xsd, this is because it's a leaf node in the overall schema layout without any other includes/imports. Every single other XSD failed with the same exception. It's a shame that JiBX can't handle this kind of schema layout, but then the HL7/CDA schema is not the best example of good schema design either.